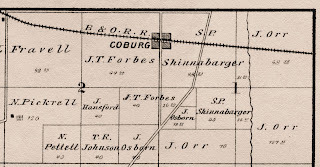 The small Porter County community of Steamburg was established in 1854 when Jacob Thaddeus Forbes migrated from Cobourg, Ontario, Canada, to Porter County. Forbes purchased 410 acres located in the southeastern corner of Jackson Township (SW½ of Section 35 and SE¼ of SW¼ of Section 36) and the northeastern corner of Washington Township (NE½ of Section 2 and NE¼ of SE¼ of Section 2). Forbes' land was heavily timbered with white oak. It was also bisected by the Sauk Trail, a significant Native American trail that was used as a travel route to Detroit; today, Indiana State Route 2 closely follows the Sauk Trail. The first pioneer to settle in the general area of Steamburg was a young man named Simon Peter Shinabarger. Shinabarger established an "entertainment house" adjacent to the Sauk Trail in the latter half of 1836, though he claimed it was not a tavern in order to avoid county regulation. By the time Forbes arrived in 1854, a small community existed consisting of five to seven houses, a general store, and Shinabarger's entertainment house. Here, Forbes erected a log cabin as a residence and set up a sawmill operated by a steam engine. Nearly all of the sawmills in operation in Northwestern Indiana prior to the 1860s were located next to streams of sufficient size to supply water power. Forbes, however, had become familiar with steam operated sawmills while living in Canada and likely viewed steam power as being more practical and versatile since a steam operated sawmill could be moved, if necessary, to be closer to where timber was being harvested. The ability to move a sawmill drastically reduced the cost of transporting logs from harvest site to mill, thereby increasing the gross operating margin of the lumber manufacturer. Forbes' sawmill specialized in the manufacture of wooden staves. He would ship hundreds of loads of white oak staves to cooper shops located in Chicago and Blue Island, Illinois, usually hauling his product by oxen team to either the Michigan Central Railroad or Lake Shore & Michigan Southern Railway lines located six to seven miles north of his sawmill. Demand was strong for wooden staves during this period as nearly all food goods were bulk shipped by rail in white oak barrels. Soon after the installation of the steam operated sawmill, the area was being referred to as Forbes Mill. A substantial amount of wood-generated smoke and steam, however, would appear when Forbes' sawmill was in operation. Accordingly, neighbors and travelers began referring to the area as Steamburg and the descriptive name stuck. By the early 1870s, a schoolhouse representing Jackson Township's School District No. 6 had been established at Steamburg; Steamburg School was the common name used to identify this school. As an ordinary practice during the pioneer period of Porter County, the Steamburg School was a multi-use community facility. For instance, the building was used for services by the local Methodist Episcopal Church members of the area, with J. Robinson serving for a period of time as the congregation's preacher. 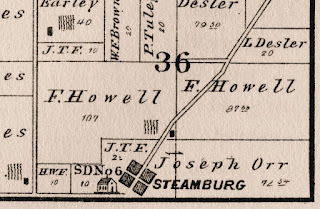 Plat map showing Steamburg in Jackson Township, 1876. Source: Hardesty's Illustrated Atlas of Porter County, Indiana. During the early 1870s, the Baltimore & Ohio Railroad had received the right to establish a rail line through Porter County. The railroad right-of-way would pass about one-half mile south of Steamburg - just over the township line in Washington Township. By 1875, the tracks had been laid through the county and trains were traversing this newly established line. Meanwhile, residents of Steamburg, not wanting to miss an opportunity to reap the financial benefits that often resulted with the establishment of a railroad, purchased land adjacent to the tracks and began moving over the township line into Washington Township. 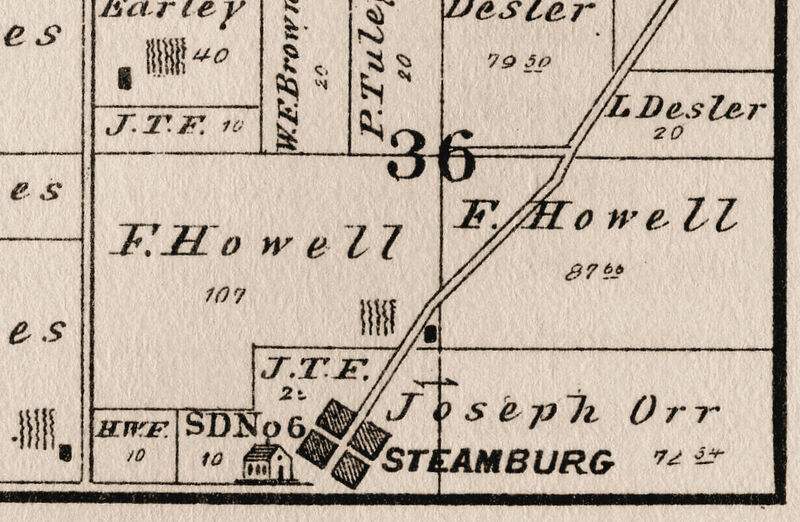 Several houses in Steamburg were dismantled and moved to the newly purchased land. Jacob T. Forbes was one of several Steamburg residents to purchase land next to the Baltimore & Ohio Railroad track, where he would soon erect a home and general goods store. Forbes would name this rapidly established community Coburg in honor of his former home in Canada. While the installation of the tracks through the area were being completed, the railroad would would also build a passenger depot and, perhaps with encouragement from Forbes, the station was accordingly referred to as Coburg. A post office, initially named Coburgh, was opened in the village on May 8, 1876, and ceased operation on January 15, 1906, with service transferred to nearby Westville in LaPorte County. The first postmaster appointed to the post office was Hamilton W. Forbes, a son of Jacob. View of Coburg, Porter County, Indiana, 1876. Source: Andreas' Illustrated Historical Atlas of Indiana. Soon after the Baltimore & Ohio Railroad line was established, the Steamburg School was renamed Coburg School, likely due to the rapid depopulating of Steamburg. This schoolhouse still stands, now serving as a residence, and is located at the northeast corner of the intersection of Old Indiana State Route 2 and County Road 600 North. 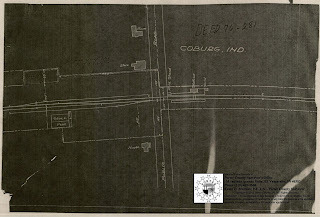 Plat map showing Coburg in Washington Township, 1876.
of Jackson Township, Porter County, Indiana, 2017. Coburg would continue to grow. The Baltimore & Ohio Railroad would construct a freight depot and milk station adjacent to their passenger depot. A substantial grain elevator was constructed to serve as a shipping point for farmers' crops grown and harvested in northern Washington Township, southern Jackson Township, and the Westville area. Like Steamburg, a dry goods store would soon be erected in Coburg to serve the local community with Jacob T. Forbes serving as the store's proprietor. Porter County plat maps published after 1876 fail to identify Steamburg, suggesting that it no longer existed as a populated area. 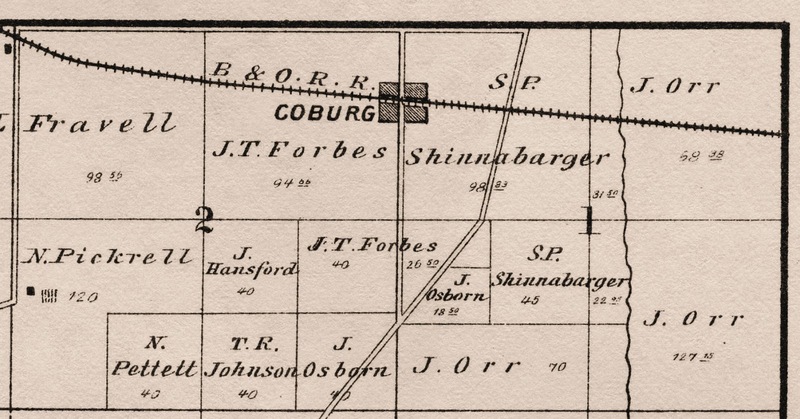 Coburg, however, still appears on some recently published maps. Farm residence of Hamilton W. Forbes, Coburg, Porter County, Indiana, 1876. Residence and store of Jacob T. Forbes, Coburg, Porter County, Indiana, 1876. Coburg, as a community, would never grow to any substantial size. Westville, located a little more than three miles to the northeast and easily accessible by the Sauk Trail (Indiana State Road 2), severely inhibited Coburg's ability to grow. And as motorized transportation expanded in the early 1900s, farmers could easily deliver their crops to Westville. Following a Public Service Commission hearing in Valparaiso on March 21, 1929, railroad service at Coburg was discontinued on September 30, 1929. Without rail service, the grain elevator at Coburg fell into disuse. A filling station located at the elevator, however, continued to operate through the 1930s. Today, evidence of the Baltimore & Ohio Railroad's passenger and freight depot, as well as the grain elevator, cease to exist and the land has reverted back to timber. 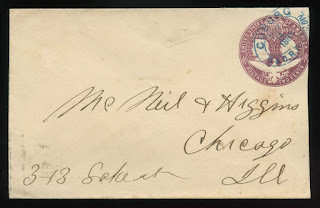 Postal cover with Coburg, Indiana, postage cancellation, 1893. 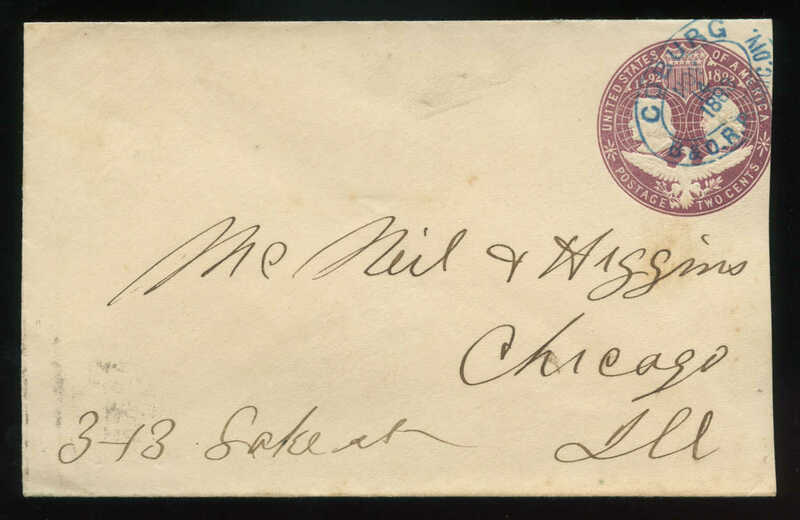 Cancel posted by a Baltimore & Ohio Railroad station agent. a wholesale grocery firm located in Chicago. Little is mentioned in local newspapers concerning activities in Coburg, suggesting that it was a rather quiet and peaceful community. However, one tragic event that took place in Coburg was the accidental death of David Douglas Smith at 6:45 pm on Saturday, May 30, 1908. Smith was a veteran engineer for the Baltimore & Ohio Railroad. While his steam locomotive, Engine No. 1475, was in Chicago and preparing to head eastbound, he had adjusted the wedges at the engine's drive wheels. When his passenger train, No. 6, was approaching Coburg he indicated to his fireman, Frank Beinke, that he was going to check the wedges he had placed earlier in Chicago to be sure that they were operating properly. Smith walked across the gangway to the fireman's side of the engine and grabbed the handles to peer down toward the drive wheels. Almost instantly, Smith's head struck the switchstand at Coburg and he was violently hurled from the train. The train was immediately stopped and Smith's lifeless body was found by the train crew. The crew loaded Smith body onto a baggage car and transported it to his home in Garrett, DeKalb County, Indiana. Smith's funeral took place on Tuesday, June 2 and was reportedly one of the largest attended funerals in the history of Garrett. Source: Porter County Survey's Office. Marshall County Republican, Plymouth, Marshall County, Indiana; November 27, 1873; Volume 18, Number 3, Page 1, Column 5. Column titled "M. E. Church Appointments." The Vidette-Messenger, Valparaiso, Porter County, Indiana; February 28, 1929; Volume 2, Page 9, Column 4. Column titled "Legal Notice of Public Hearing." The Vidette-Messenger, Valparaiso, Porter County, Indiana; October 5, 1929; Volume 3, Page 1, Columns 2-3. Column titled "Coburg, Once Thriving Shipping Point on B. & O. Railroad, Loses Agency When Business Slumps." The Vidette-Messenger, Valparaiso, Porter County, Indiana; October 5, 1939; Volume 13, Page 4, Column 8. Column titled "Ten Years Ago." The Vidette-Messenger, Valparaiso, Porter County, Indiana; November 21, 1956; Volume 30, Number 119, Page 1, Column 1 and Page 6, Columns 1-2. Column titled "Humor in Holiday of 1867 Seen." The Vidette-Messenger, Valparaiso, Porter County, Indiana; February 28, 1961; Volume 34, Number 201, Page 1, Columns 1-2 and Page 5, Columns 3-4. Column titled "Town of Steamburg is Only Dot on Old Maps."